Philip Simmons is a Lowcountry legend – especially in the architecture community here in Charleston. His work can be seen all over from The Smithsonian to China, but the mark he left on Charleston is simply unforgettable. He was born on June 8, 1912 on Daniel Island and moved to Charleston at the age of 8 to attend school (modern day’s Buist Academy). He lived with his mother on Vernon Street (which was the center of all things craftsmen) and began gravitating toward the art of metalworking while walking to and from school everyday. He gained his most valuable education from Peter Simmons (a local blacksmith, no relation) with whom he apprenticed under for 5 years after quitting school at the age of 13. By 1938, he opened his own shop on Blake Street and began taking his work to the next level. What Simmons is most remembered for are his breathtaking wrought iron gates and other ornamental work that can be seen all over Charleston. His gate work began in the early 1940s thanks to a local businessman named Jack Krawcheck, who commissioned a wrought iron gate for his King Street store. 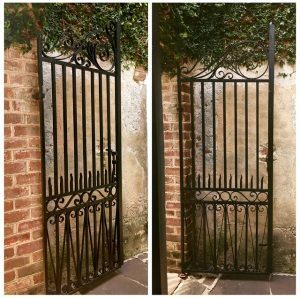 Simmons had to create the gate out of scrap iron because the demand for iron during World War II made it impossible to acquire new iron. This gate was the first of many pieces he would create for the Krawcheck family during his career. Simmons went on to create over 600 iron pieces ranging in size from balconies, window grilles, fences and gates to fire pokers and tools. Simmons died in 2009 and his family and colleagues want to merely fulfill Simmons’ last wish, and that is to make sure his trade is carried on, which is why engineer John Paul Huguley founded the American College of the Building Arts. 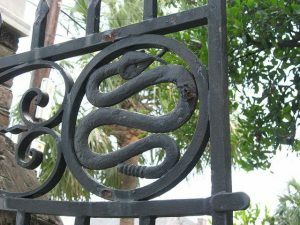 The school restored one of Simmons’ most significant gates, the coiled rattlesnakes at 329 East Bay Street. The memory of Philip Simmons lives on today through The Philip Simmons Foundation where you can find both replicas and sterling silver jewelry inspired by his work. You can also take a stroll through downtown Charleston to see the gorgeous ironworks in person. You can learn more about Philip Simmons by watching his hour long documentary here. "Philip Simmons is a poet of ironwork. His ability to endow raw iron with pure lyricism is known and admired throughout, not only in South Carolina, but as evidenced by his many honors and awards, he is recognized in all of America."